Just a few years ago, the mention in Utah of a tapas restaurant would've drawn blank stares. But now, Utahns are taken with tapas, small-portion hot or cold appetizers and snacks that are traditional components of the dining experience in Spain. Also called pinchos, they're a way to share a few bites with friends and socialize prior to a meal. "Tapas let Utah diners experience a lot of flavors that they would not usually try," says Phelix Gardner, chef at popular Spanish restaurant Finca. "The lower price point per dish lends to people being more adventurous, because if they don't particularly love that one dish, they still will have plenty of other things to try." Finca and Café Madrid offer what would be considered traditional Spanish tapas—with their own regional flair. Other small-plate establishments such as Eva, Meditrina, Faustina and Caffe Niche have taken inspiration from the Spanish way of dining, but have chosen to explore other regions and tastes of the world, with an occasional nod to their European predecessor. "We consider ourselves 'small plates' instead of 'tapas,'" says Jennifer Gilroy, owner and chef at Meditrina. "We do offer a bit of traditional Spanish cuisine, but I like to play with my food way too much to call myself 'traditional' anything. Adaptation of flavors from regional cuisine is a very personal thing." 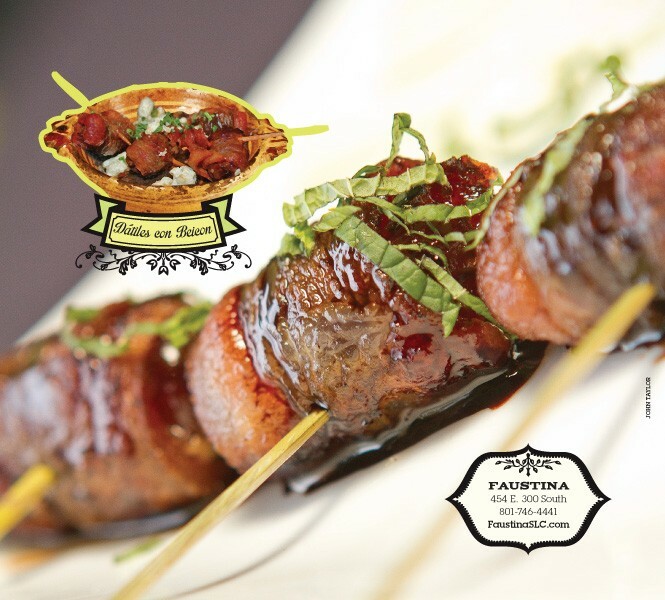 Meditrina's stuffed dates, filled with a savory mix of chorizo and local chevre with a red-wine demi-glace, are Gilroy's "current throwback tribute. I like to fuse unlikely ingredients to create balanced, layered and robust flavors." You'll also find a mouthwatering take on dátiles con beicon—almond-filled, bacon-wrapped and cheese-stuffed dates—on the small-plate menu at Faustina, part of the restaurant's renewed focus on bite-size offerings. And up the street at Caffe Niche (779 E. 300 South, SLC, 801-433-3380, CaffeNiche.com), owned by Faustina's parent company, Chef Ethan Lappe looks to the ingredients to provide inspiration. "We try with our small plates to highlight certain preparation and products that lend themselves to smaller portions, such as smoked salmon and tuna tartare," he says. The ahi tuna tartare nachos, presented on a fried wonton, feature big-eye tuna caught by a fisherman friend in Hawaii; it's flown in three to four times a week. Salt Lake City chefs also delight in working with local seasonal ingredients that complement the tapas tradition. "We always offer one to three seasonal vegetable features," Lappe says. "Most items are simple, highlighting the freshness and innate qualities of the beautiful products available to us here." Finca makes "Spanish dishes our own," Gardner says, by "working in the seasonality of our approach to food, and [we] use Utah flavors to complement the Spanish traditions." Right now, he's crafting a new dish highlighting Monterey Bay squid with squid-ink vinaigrette and pickled Utah apricots. It's a modern and local take on the chipirones en su tinta (squid in its own ink) that I adored at the world's oldest restaurant, Casa Botin, in Madrid, during a nine-day trip to Spain earlier this year. A friend and I, both frequent diners at Salt Lake City's tapas restaurants, were determined to compare bites we had been introduced to (and fallen in love with) in Utah with the original Spanish delicacies as we ate our way through Barcelona and Madrid. Our arrival in Barcelona prompted us to seek the familiar first. Orders of patatas bravas (chunks of potato fried and then served with an aioli or other mayonnaise-based sauce) and croquetas topped the list. We were disappointed in our first order of patatas bravas, which was quite bland. 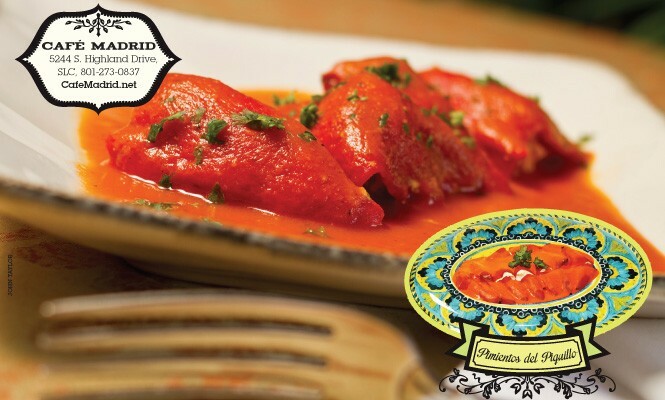 We tried them another four times, but found that they always paled in comparison to the brighter, more intense flavors found at Meditrina, where they're served with spicy tomato aioli and chili oil, or to Finca's version, which features paprika and a pungent, addictive garlic aioli. 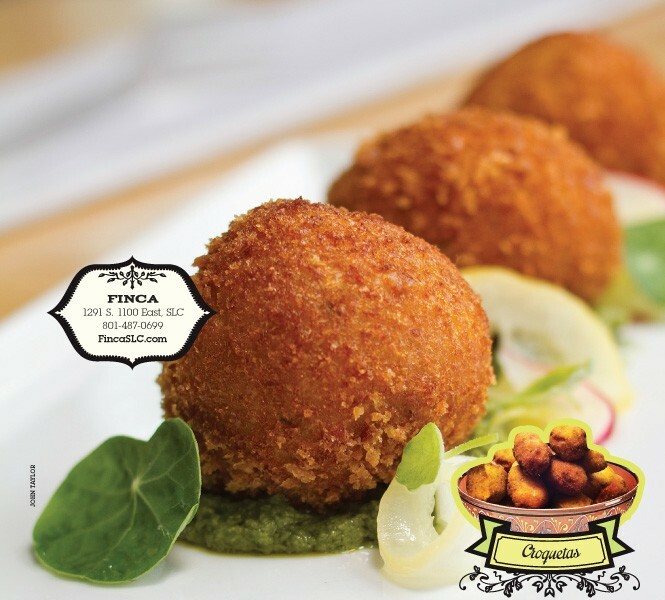 Similarly, none of the croquetas we ate delivered the texture or flavors packed inside Finca's chicken version, although they did bear a striking resemblance to Café Madrid's fried bechamel balls, which are filled with ham and enveloped in a crispy, golden-brown shell. One item that appeared on virtually every menu in Barcelona was pan con tomate (tomato bread), and we were thrilled when it arrived on Finca's menu shortly after Gardner and owner Scott Evans returned from an April research trip to Barcelona and San Sebastian. "This is the most simple and incredibly satisfying dish during the peak of tomato season," Gardner says. "We grill the bread until it's very crispy, and rub it with raw garlic. Then we take a halved tomato and rub in onto the bread. It then gets simply finished with olive oil and Maldon salt." Some years ago, I was introduced to the pimientos del piquillo tapa (stuffed piquillo peppers) at Café Madrid, which sent me on the hunt for this inspired bite in—where else?—Madrid. Although Mesón Cinco Jotas restaurant came close, Café Madrid's roasted peppers, filled with white-wine-infused seafood, couldn't be topped. The variety and freshness of Spain's seafood tapas made them particular favorites of ours. Fortunately, octopus appears regularly on Salt Lake menus. "We sear the octopus on the plancha, and then serve it in a paprika and sherry vinaigrette along with fried potatoes and mild green olives," Gardner says. 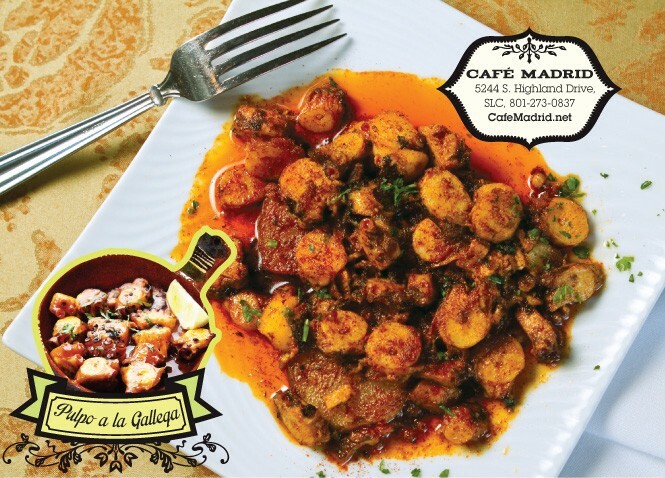 And Café Madrid delivers tender chunks of octopus that are sauteed in kicky paprika olive oil for the simple yet decadent dish pulpo a la Gallega. 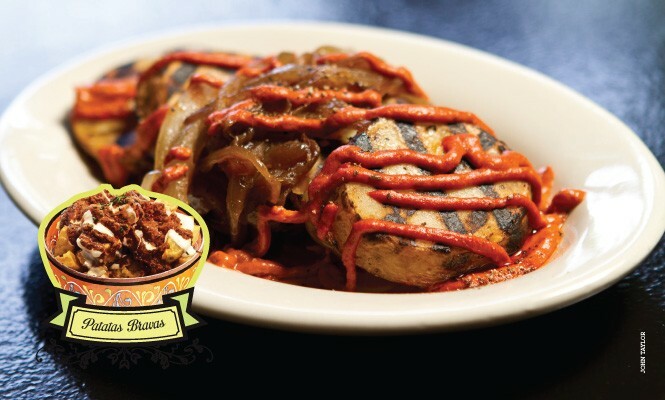 With the small-plates concept now a mainstay, more daring and intriguing tapas options are on their way to Utah diners. Meditrina launched a Tapas Tuesday promotion in early summer with all-you-can-eat small plates for $22. A new chef has just taken the helm at Café Madrid, and Martine (22 E. 100 South, SLC, 801-363-9328, MartineCafe.com) has a remodeled interior and menu. In late fall, Finca will be moving downtown, where the restaurant will offer a pinchos-based lunch option in the lounge, enabling guests to order food and a drink and be sitting down and eating within 10 minutes of coming in. I've been savoring the memories I formed in Spain one bite at a time, and I'll be happy to relive them regularly with the help of local restaurants that develop flavors with care and purpose to feed Utahns' growing passion for adventurous dining.